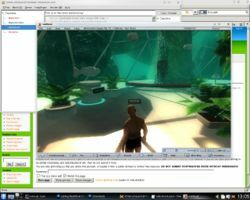 It's already possible to testrun modrex on linux/macos, so a crossplatform solution for the viewer is needed as well. Most libraries used in the RealXtend viewer are cross-platform. Nevertheless there are some windows dependencies, which prevents the viewer to compile and run on the Linux/OSX platform. In the meanwhile we can use the viewer through the use of wine. Wine allows to run native win32 applications on Linux, and on OSX using the Darwine modifications. Wine is not an emulator, and is faster than one might expect. RealXtend runs quite stable on wine(40/50 fps) with archlinux i686 distro, nvidia 8600GT, Athlon 3200+ and 2GB ram. Tweak wine in case the viewer crashes. This page has been accessed 20,131 times.